Nowadays there are a lot of cheap USB flash drives available in market. If you go for the price factor and get a cheap one you might end up buying a drive which might die within a few hours of usage. The drive won’t read files or might not even get detected in your pc. The biggest drawback of these cheap drives is that you usually don’t get warranty on them. You need to throw them off. If would be great if you could test the drive before buying. Well if the dealer is your friend he might allow you to do so. 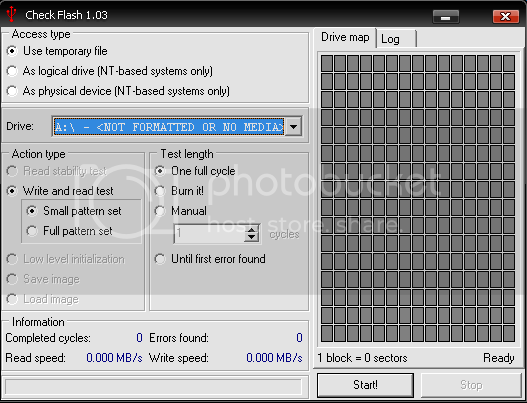 There’s a small utility- CheckFlash which helps you to test and format your USB Flash Drive. The software runs a burn in read and write test on the drive. If it is able to survive after a few cycles, the USB flash drive is fine. It also determines the read and write speed of a USB Flash drive. You can download CheckFlash for free from here(developers site). It’s a single portable executable file.